Networking is the name of the game here in GDC, and DSU senior Sean Daily was all over the concept with his accidentally epic first encounter with William Pugh, one of the developers of the Stanley Parable itself. In an incident that shall no doubt be passed down the Daily line for ages to come, Sean’s discussion of the Stanley Parable coincided perfectly with the appearance of Mr. Pugh and his friends on the side-walk in front of us, conveniently within earshot. Mr. Pugh’s retort, consisting of a bout of humorous self-deprecation that should come as a surprise to no one who played his game, left all but Sean in a fit of giggles. Fortunately, Sean learned from the initial hiccup and his desire to compensate for it carried him through all future social interactions smoothly. The Stanley Parable designer wasn’t the only top-notch developer Sean and I ran into. However, for the sake of brevity (and my own laziness) it would probably be best not to provide the entire list. 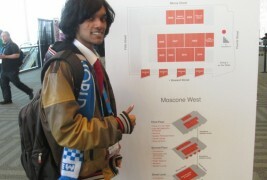 It suffices to say that my first impression of GDC went beyond initial expectations. The surprisingly informal face of the Game Design world, together with the extreme amicability and unexpected diversity combined to provide a core experience that was both educational and inspirational. The biggest thing to worry about in GDC is deciding which conference to go to. With so many amazing programs happening simultaneously, it is indeed a tough choice to make. But even more important than the dialogue and the workshops are the connections you make in the Game Design World. The value of putting a face to all the amazing names of game developers is something that should never be underestimated. In conclusion, DSU advises future potential attendees to GDC to know what your favorite game designers look like before running into them! Stay tuned for our regular GDC updates! The Trojan Times' Titanfall Tips.